When Ceefax ended in 2012, the world lost its flagship teletext service. By that point however, the new information landscape was already teeming with a community of experts and enthusiasts who have taken up the teletext torch. Having worked on both Ceefax and Oracle before their demise, Peter Kwan was well placed for his next, audacious feat: putting British teletext back in action. His Teefax service syndicates Ceefax from live BBC feeds and also features fresh content from media legends like Mr Biffo and other creative contributors. Teefax runs on the bank card-sized Raspberry Pi computer kit and it's not only accessible online: users can employ a similar setup in their homes to pipe the service into teletext-ready TVs. If Teefax is down when you take a look, do check back; it's early days in a new era. Late night pages from Ceefax and a host of other regular programmes were recorded by home video decks over the years. Astoundingly, many of these recordings contain recoverable teletext data in their margins, unbeknownst to the very consumers who filled the tapes. By using and enhancing a code library called vhs-teletext, Jason Robertson has been rescuing this data. A multitude of colourful teletext curiosities have sprung back to life, from recordings made as far back as the 1970's. At Teletext Block Party 2016, Robertson demonstrated his process and took possession of loads of donated videotapes. Word has spread since and more tapes have come in, with Jason continuing to share the teletext recovered from these cassettes. Dan Farrimond has been a patron of pixel arts since before Ceefax signed off. He maintains a gallery and blog and contributes to the Teletext Bock Parties. He also co-hosts the the Teletextr podcast with Carl Attrill. Dan's teletext worksheet (pictured above) allowed viewers of German television to contribute hand-drawn teletext art for broadcast. 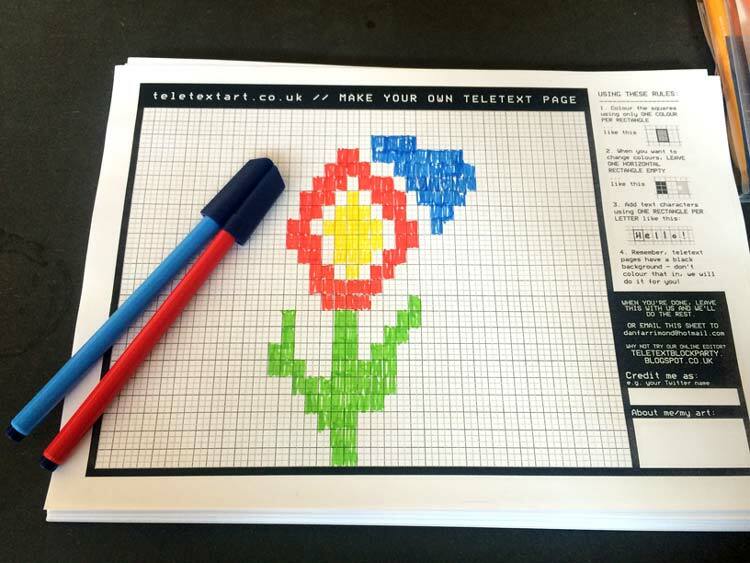 Here's an updated PDF of the worksheet in case you'd like to try your own hand at offline teletext art. 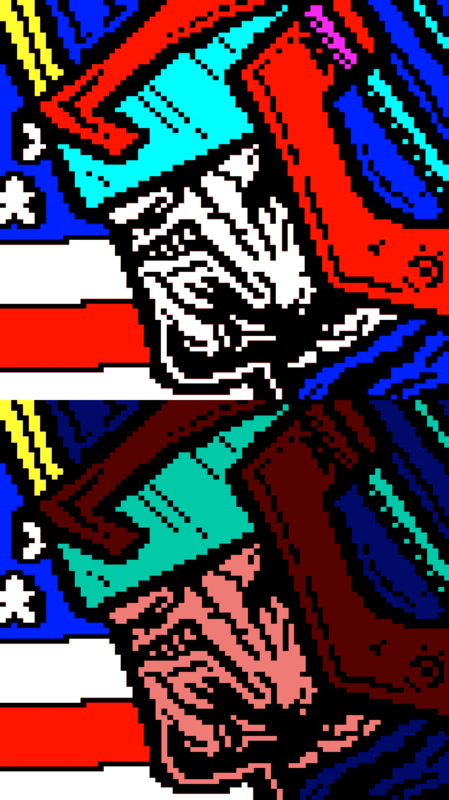 Steve Horsley is a prolific pixel artist producing detailed, full-page teletext art. 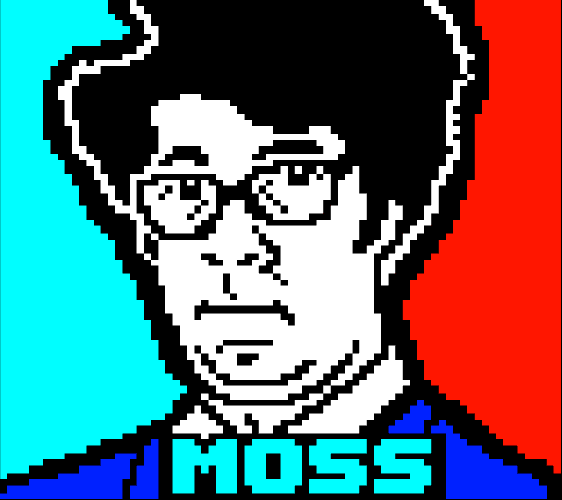 One of his main themes is pop culture icons including Moss from the IT Crowd, shown here. Steve maintains a gallery of his work at horsenburger.com. Teefax, broadcasters and PagesFromCeefax.net populate some of their live pages with data from internet feeds. Other pages are made using an editor programme. A number of freely available teletext editors are about including wxTED, a Windows app developed and maintained by Peter Kwan. The Edit-TF web app is an editor that stores its work in the link in the web browser's address bar. This allows users to easily share their creations in social media, letting teletext well and truly out of its box. Developer Simon Rawles named Edit-TF in honour of 'teletext's fortieth' – its anniversary in 2014. Since then he's retweeted contributions from social users who've had a go at making teletext frames of their own. Simon maintains an archive of them on his own site and in Teefax. What the general public think of as teletext is basically one version of World System Teletext, developed in Europe with a majority contribution by the BBC. It's still used in television outside Britain and on display boards in places like airports and hotels. The space occupied by each letter in teletext can instead contain a grid of six pixels, two wide by three high. The colours and backgrounds of these sixels can be combined to produce pictures like the one above. Well, almost. 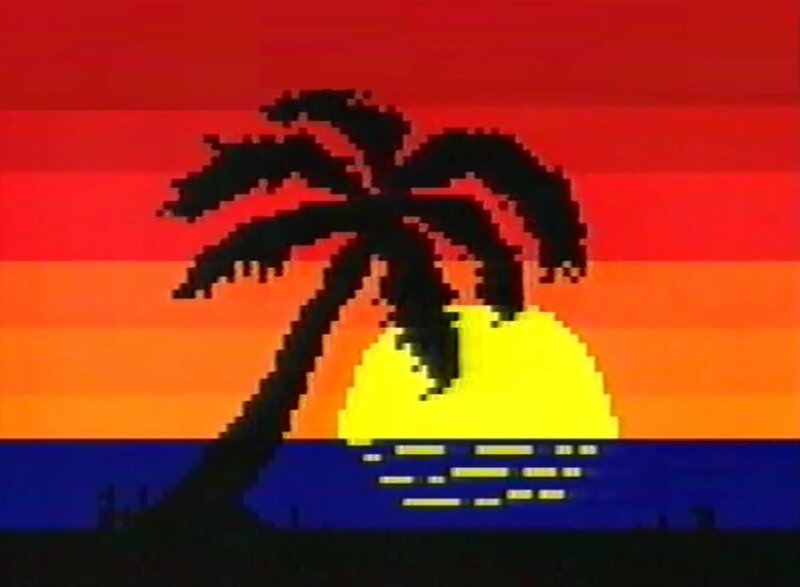 This palm tree via Russell Wright uses different colours than those in the classic teletext palette. Enhanced teletext allows for more colours, better graphics detail and wider screens. 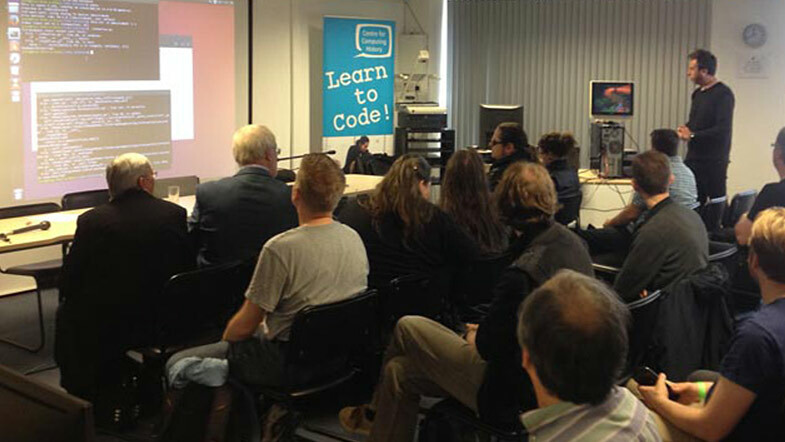 It's used by a handful of broadcasters in Europe and is increasingly explored by teletext enthusiasts like Alistair Cree, who is developing an enhanced teletext editor. He's also developing a teletext viewer, which is quite a nice way to view Teefax. It's operated by a skeuomorphic remote control, so you'll need to actually turn the viewer on and engage teletext mode to use it. The new viewer is able to render enhanced teletext pages. Experimenting with the additional colours available in enhanced teletext, Steve Horsley has reworked an item from his own textwork gallery. Both versions of the artwork are shown here. Teletext-style pixel art is perhaps more visible than ever, in hit games like Minecraft, live performances of chiptune music and retrogaming on little single-board computers like the Pico-8. Amid this environment, teletext lives quite well. Further reading: Teletext Design, a survey of techniques and Teletext Future, some thoughts on what the medium will do with its new vitality.